Thank you for a great 2018! 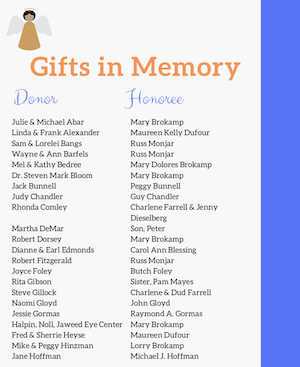 We want to extend a extra special thank you to those who’ve given gifts in honor and gifts in memory. 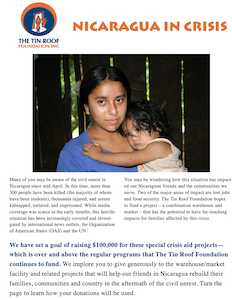 By now, you should have received your “Nicaragua in Crisis” fall mailing. We hope this provided you with more information about the dire situation in Nicaragua, as well as how you can help. As we celebrate this joyous holiday season, we hope that you will remember our friends in Nicaragua, many of whom have lost their jobs, their homes, and their sense of safety and security. In the spirit of Christmas, we should pause and be thankful for all that we have – but we should also remember those who have so little. 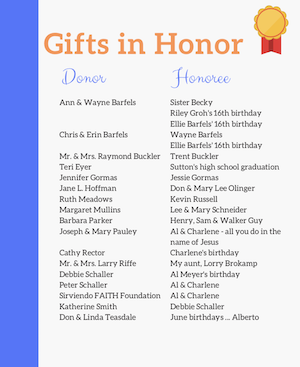 We ask you to prayerfully consider donating generously toward the combination warehouse and market project that we outlined in the fall mailing. Let’s follow Jesus’s example – putting others before ourselves – and we can truly make a difference. Foundation, Inc. 1047 Nordyke Road Cincinnati, OH 45255. Or, click here to make your donation online. Though the civil unrest has not markedly improved, we are pleased that more and more international news outlets are continuing to cover and investigate the situation in Nicaragua. We are hoping that bringing attention to the events that have caused the deaths of more than 300 people and disappearance of countless others will help to eventually bring about resolution and positive change. We will soon be launching a crisis relief campaign to raise funds to support rebuilding, including securing a new facility for housing warehouse space and a market. Watch your mailbox for more information on this important effort in the coming weeks. 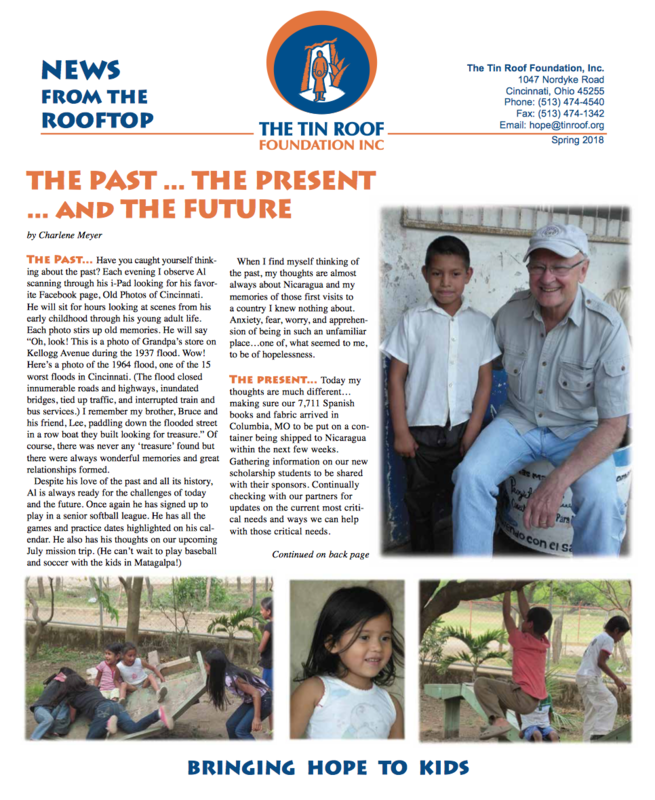 We need your prayers and generous support to bring hope to kids and families in Nicaragua! Please keep praying for Nicaragua and our many friends and partners there. We will continue to keep you updated as the situation unfolds. We wish we had better news to report. However, the civil unrest continues in Nicaragua. We are happy to report that the United Nations High Commissioner for Human Rights and the Inter-American Commission for Human Rights have been permitted into the country to assess the situation and help bring about a peaceful resolution. We know that there will be a great need for humanitarian aid throughout the rebuilding process in the coming months and years – in addition to our regular programming. We hope you will continue to support our mission of “bringing hope to kids” during this tumultuous time. As many of you many know, Nicaragua has been affected by several days of civil unrest and violent protesting. Sadly, many lives have been lost and both public and private property has been destroyed. Although the situation has calmed in recent days, there is a still a very tense environment. Despite the disruptions, we have continued to provide program services to students and their families. We ask that you join us for praying that peaceful solutions can be attained for the current social and political crises that affect Nicaragua. In the midst of the turmoil, we had to go out into the mountains to purchase fruits and vegetables for the school nutrition program. The rural areas have not been affected by the protesting and life has continued its normal course. 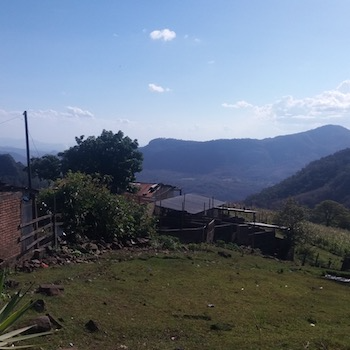 As we drove from farm to farm, purchasing squash, huge bunches of bananas, fresh cheese and cream, I was reminded of the deep generosity, humility and diligence that characterizes Nicaraguan culture. That drive through the beautiful mountains helped to put the situation into perspective and focus on the vital importance of our work. We ask that you join us in praying for peace for Nicaragua. In response to the crisis, we are hard at work developing a faith based curriculum for young people, focusing on peace education, conflict resolution, tolerance and dialogue.